Diptychs featuring the same saint or subject are not the norm, it kinda defeats the purpose. But, like icon bracelets, icon T-shirts and icon mugs, these things are made without due regard for what is proper. What is you opinion on these icons? Please explain this icon. What is the Archangel holding? 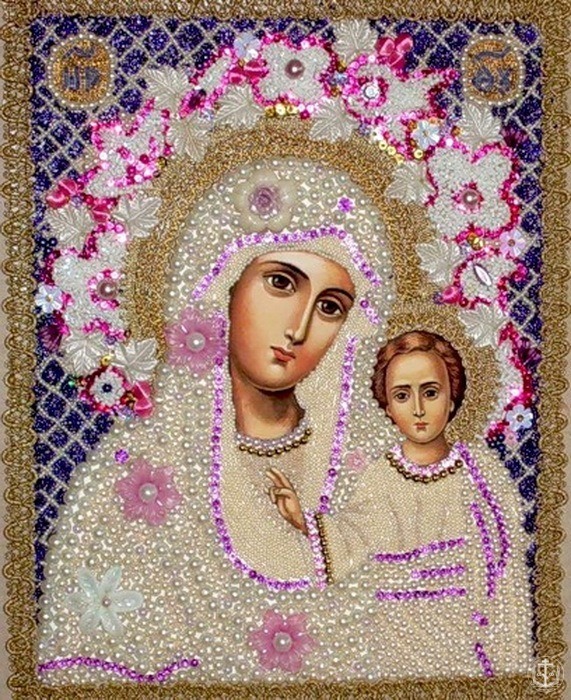 I see the bead and sequin treatment as unnecessarily embellishments, similar to the placing of embossed silver or gold (often set with gemstones) on icons. It's an honest but misguided attempt to "beautify" icons. Gilding lilies, frou-frou and all that. Other embroidered icons are made for clerical vestments and altar cloths. The "look" of these is in keeping with the sober, sombre dignity of conventional painted icons, unlike the unfortunate gaudiness of the beaded icons posted. The archangel is Michael, and he is holding a circular motif of the souls of the departed prior to the Final Judgement. In his right hand is his messenger's staff, not, as many mistakenly believe, a spear. He is an emissary of the heavenly court (royal household). ^Reminds me of something I found recently on ebay, where they put gold paint on a printed icon. Of course they also make sure to put "handpainted" in the auction title. What finesse and precision we see, what delicacy of workmanship! There oughta be a law. Seriously. Oh no, something that sloppy does carry a certain amount of finesse, like the guy who spends 45 minutes making sure it looks like he's got bedhead before leaving for work. If you are gonna get all aggressive with the gold paint, at least make it look good. That is the blobbiest (is that a word?) wreck I've ever seen. Princes and Chiefs of the heavenly realms, of the high-throned and dread regions of the divine glory, Michael and Gabriel, Chief Captains and Ministers, with all the Bodiless Powers, who ever intercede with the Master on the world’s behalf, ask forgiveness of offenses for us, and that we may find mercy and grace on the day of judgement. Just to supplement your excellent summary: in the Greek practice the Epitaphios is placed on the Holy Table near the end of the Matins of Great and Holy Saturday (just after it brought back into the Church following the procession around the building). I'm not sure if the Slavs then observe the same custom, but it is then left on the Holy Table until just before the Vespers for the feast of the Ascension of our Lord. While it at times seems odd to me (because of its particular execution in parishes), frequently the Epitaphios cloth is displayed inside a glass encasement in the Church when it is not used. This phenomenon supports your description of it being worthy of veneration and maintaining the sobriety of the other traditional iconography (as does the Epitaphios's common ancestry with the Antimension and Aer). The Slavs do this as well. I have only seen the enclosing of the Epitaphios in a frame in Greek churches. 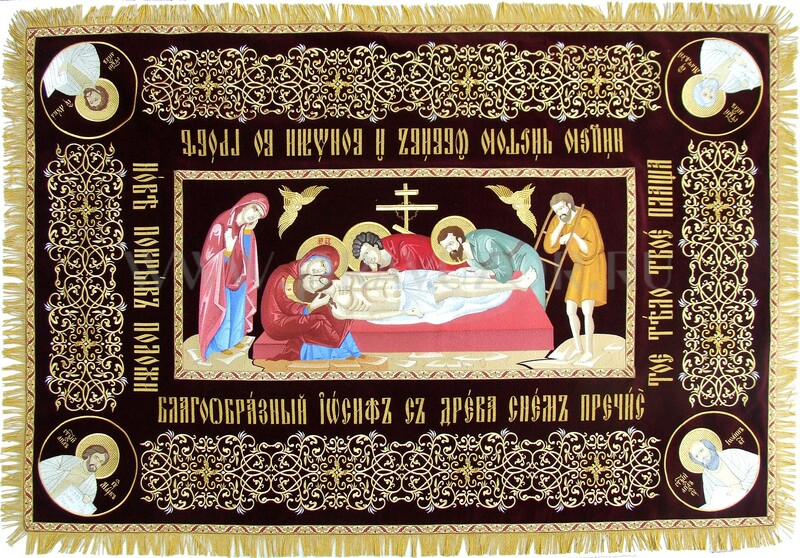 Another difference is the Russian tradition of a plashchanitsa for the Dormition of the Mother of God, depicting the icon, or sometimes, a simpler composition of just the reposed Virgin, with the words of the troparion of the feast embroidered in the border. The usual colors are blue for the cloth, and silver or white for the lettering and embellishments. Who's the saint in the lower right? Are there other icons where the souls of the departed are depicted that way? This depiction can also be seen in icons of the feast of All Saints. That's nice and unexpected. But to the bosom of Isaac and Jacob, too? I'm sure the hymns of the Sunday before the Nativity, which commemorates them, would have something to say about it. I'll see what I can come up with. I've seen it more often (and prefer it) that the Epitaphios is placed in the tomb again in the center of the Church after the procession of Great and Holy Saturday (i.e. Friday evening) and left there (with people taking vigil in shifts, chanting the NT or Psalms) until Paschal Matins (i.e. Saturday evening). The clergy, gathered around the tomb, during the Ode "Do not lament Me," at the point where "for I shall arise..." is sung, elevate the Epitaphios and process with it into the sanctuary and place it on the Altar. This. No carrying shroud on paschal procession. I think I recall the icon which is the subject of this post being put up on this thread before (or perhaps the unusual icons thread) and condemned as schlock. Very nice story. Perhaps a reminder to those of us who go too far in our rigidity out of ignorance. I think I recall the icon which is the subject of this post being put up on this thread before and condemned as schlock. On the contrary, Antonis. We are to "test the spirits", are we not? Where in received and accepted Orthodox tradition and doctrine does it refer to the Mother of God as a priest and minister of the Eucharist? Or even a deaconess in the ancient sense of the word? If she were, this would be a free ticket to those advocating for the priestly ordination of women. Indeed, an Orthodox female priesthood would have been instituted from the earliest centuries of the Christian era if this image reflected Orthodox teaching. It is telling that it was not. Iconography is not about “pious custom” or “what feels right”, or even "what a particular saint saw in a dream or vision", when this is contrary to accepted doctrine and theology. Our saints are not infallible. Iconography is about theology and doctrine, of expressing the Mysteries, the things of God which cannot be fully known and comprehended by mere human minds. If adherence to what the Church teaches is "rigidity", then I'm happy to be guilty as charged. I trust generations of monks of a holy lavra as being better "testers of spirits" than I do single posters on internet forums, regardless of who they are. "Fall back on the Tradition of the Church, except when it's one I don't like." As for being caught up in the Mother of God not being a priest, I think this is a case of intellectual orthodoxy getting in the way of Orthodoxy. There are many things in our Church that may seem thoroughly unorthodox to our rigid orthodox, yet are perfectly Orthodox. Perhaps when we get beyond our own minds (I know I desperately need to) and become true theologians by experience we will fully understand it. I don't think adherence to the teaching of the Church is "rigidity," I think unbending adherence to our own intellectual ideas of what the Church teaches is rigidity. Some will never admit their error. Would you venerate this image, whose inscription is Bestower of the Gifts, in good conscience? The Mother of God vested in episcopal vestments, and holding a chalice? Would you regard it as expressing the established and universal Orthodox teachings on the Mother of God? Would you finally get that direct links to pictures on pravicon do not work? Links embedded within the img function do not work with certain browsers. Plain links to the image do work. No, because (as far as I know) such a witness of the Mother of God does not exist in the Church and she is not a bishop. There are no such problems with the one I linked, though. Where is the witness of the Church that the Mother of God is a priest and minister of the Eucharist? I already answered that in my first reply. Further, she was not vested as a priest in his vision. Still, I do not doubt the symbolic significance of his vision. Again, I trust the discernment of generations of monks from this lavra AND their bishops over the scruples of internet experts. Our personal insistence on orthodoxy often seems to overshadow Orthodoxy. But I already said that and it was ignored. As for being caught up in the Mother of God not being a priest, I think this is a case of intellectual orthodoxy getting in the way of Orthodoxy. I ask again: Where is the witness from established and universally-accepted Orthodox tradition (from hymnography, from scripture, from the historic iconographic deposit, from patristic writings, from pronouncements from ecumenical and synodal councils) that the Mother of God is held up as a priest and minister of the Eucharist? Is every miracle of the Church written about in numerous hymns, commented on by numerous fathers, or detailed by our holy councils? Further, she was not vested as a priest in his vision. Still, I do not doubt the symbolic significance of his vision. Again, I trust the discernment of generations of monks from this lavra AND their bishops over the scruples of internet experts. Whether she is vested or not is almost beside the point. She is administering the Eucharist, something consistently and unwaveringly the privilege and duty of clergy. A very large chunk of Orthodox hymnographic, patristic and hymnographic deposit is dedicated to the Mother of God. She is spoken of in the most fulsome terms, yet, in their wisdom, the sainted hymnographers, iconographers and Fathers have never spoken of her as a priest. Surely, such an important symbolic status for the Mother of God would have been proclaimed and extolled, in the same way that the many OT prefigurations that have found their fulfillment in her are in our hymns, prayers and icons, such as the Burning Bush, the East Gate, the Uncut Mountain, and many more. Furthermore, the statement "He was crucified for us under Pontius Pilate" was added to the creed to indicate that the Crucifixion was not simply an allegorical or symbolic event, but one that occurred in a specific time and place. Similarly, the idea of saying that the Mother of God was a symbolic priest and minister of the Eucharist is, at best, just incorrect pious tradition. At worst, it's straddling the gnostic concepts of undercutting the reality of Christ's mission and the occurrences. Just say she's an eucharistic minster, and problem solved. Furthermore, the statement "He was crucified for us under Pontius Pilate" was added to the creed to indicate that the Crucifixion was not simply an allegorical or symbolic event, but one that occurred in a specific time and place. Similarly, the idea of saying that the Mother of God was a symbolic priest and minister of the Eucharist is, at best, just incorrect pious tradition. At worst, it's straddling the gnostic concepts of undercutting the reality of Christ's mission and the occurrences. She is not a symbolic priest, and that is not what this icon depicts. It depicts a vision of a novice and his elder in which the Theotokos refuses to commune said novice. Perhaps we should look beyond our obsession with the minutia and see the message. And the Saint replied to him: "That which you saw was for your correction. The brothers are informed that the Panagia sanctifies them to be worthy at every celebration to commune of the Divine Mysteries." Since then and henceforth, therefore, he toiled more and ate less, and living thus with blessed obedience, he was made worthy of heavenly blessedness. For instance, my mind immediately went to the Panagia's role as a mediatrix of Grace, and her dispensing the Gifts as dispensing Grace. Perhaps I am entirely off-base, this is just one possibility and I could be (read: am likely to be) entirely wrong. An icon is not merely religious art. An icon must proclaim what is consistent with Orthodox teaching, accepted by the entire Church as proper. The administration of the Eucharist is a distinctive and profound act, and one which the Church has never ascribed to the Mother of God. 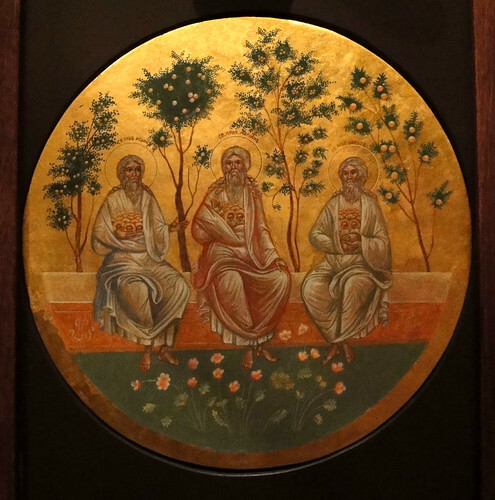 One man's vision, even if he be a saint, does not trump the accepted testimony of the Church, and certainly does not warrant the painting of an "icon" describing it. The painting of an icon confers the doctrinal imprimatur of the Church upon what is depicted, where what is depicted conforms with Orthodox teaching. This entire thread is filled with examples of "icons", many painted in good faith, which do not conform with Orthodox teaching. This image is one of them. I'm not denying the saint saw the vision, but to elevate it to the level of accepted universal Orthodox teaching through the painting of an "icon" of it is simply wrong. My point is that I am not a theologian by experience, and thus could not possibly fully understand such things by my intellect and think it would be arrogant of me to assert my opinion over generations of noetically illumined and their bishops (whose opinion is the one that truly matters). The view of one bishop, or even a group of saints, does not trump the accepted testimony of the Church. Orthodoxy does not hold to the infallibility of saints or clergy. For instance, my mind immediately went to the Panagia's role as a mediatrix of Grace, and her dispensing the Gifts as dispensing Grace. Perhaps I am entirely off-base, this is just one possibility and I could be (read: am likely to be) entirely wrong. My point is that I am not a theologian by experience, and thus could not possibly fully understand such things by my intellect and think it would be arrogant of me to assert my opinion over generations of noetically illumined and their bishops (whose opinion is the one that truly matters). I don't really have an issue with this icon. It is the depiction of a particular phenomenon associated with the monastery where this icon can be found. Should the painter have chosen a non-iconographic style to paint that image? Sometimes, I think our theology of icons prevents us from seeing icons as art. But here's some drive-by theology: the Body and Blood of Christ which we receive in the Eucharist is Christ's flesh, Mary's flesh, and our flesh. Affirming the truth of those claims in their proper degree does not necessitate bad theology. The key words in Mor's statement are "in the proper degree". The iconographic portrayal of the Mother of God as minister of the Eucharist is not in the proper degree, far from it. It proclaims her as being something she never was, and something she still isn't. But this begs the question about the original vision, LBK. If the monk in question was granted this vision in order to teach him a particular lesson, why not depict it as it occurred? Why does he get to see our Lady distributing Communion and describe the vision to others, and yet it can't be painted? Surely God is in his heaven, knowing what he's doing? Or does the vision not come from God? What I know is that icons are to depict what is in harmony with what the whole Church teaches. I also know that visions are to be regarded with great caution, irrespective of whether they are seen by saints, monastics or laymen. It is one thing to show in an icon the Mother of God handing back St Nicholas of Myra's omophorion which had been stripped from him at the Council of Nicea, and quite another to show her as minister of the Eucharist.